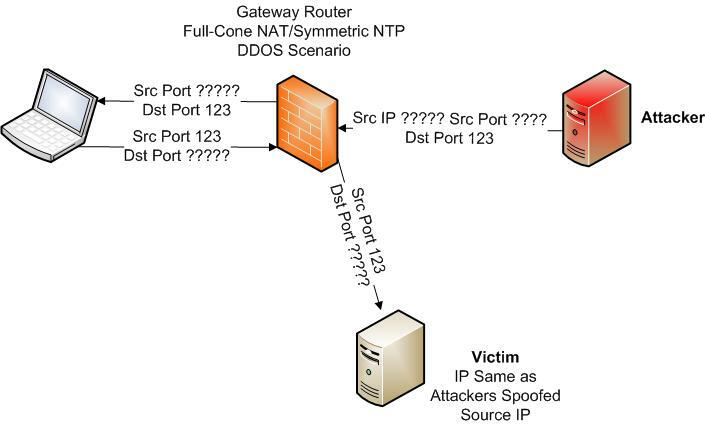 Part 2: Is your home network unwittingly contributing to NTP DDOS attacks? This diary follows from Part 1, published on Sunday August 17, 2014. How is it possible that with no port forwarding enabled through the firewall that Internet originated NTP requests were getting past the firewall to the misconfigured NTP server? The reason why these packets are passing the firewall is because the manufacturer of the gateway router, in this case Pace, implemented full-cone NAT as an alternative to UPnP. However if UDP Session Control is disabled, as it is in this device, then this device implements full-cone NAT (RFC 3489). Full-cone NAT allows any external host to use the inbound window opened by the outbound traffic until the timer expires. Remember anytime traffic is seen on the correct port the timer is reset to 600 seconds, thus making it possible for this communication to be able to continue virtually forever as long as one or both devices continue to communicate. The really quick among you will have realized that this is not normally a big problem since the only port exposed is the original ephemeral source port and it is waiting for a NTP reply. It is not likely to be used as an NTP reflector. But the design of the NTP protocol can contribute to this problem. Symmetric NTP opens up the misconfigured server to be an NTP reflector. Assuming there is an NTP server running on the originating machine on UDP port 123, if an attacker can find this open NTP port before the timeout window closes they can send in NTP queries which will pass the firewall and will be answered by the NTP server. If the source IP address is spoofed the replies will not go back to the attacker, but will go to a victim instead. Of course UDP is stateless so the source IP can be spoofed and there is no way for the receiver of the NTP request to validate the source IP or source port permitting the attacker to direct the attack against any IP and port on the Internet. It is exceedingly difficult to trace these attacks back to the source so the misconfigured server behind the full-cone NAT will get the blame. As long as the attacker sends at least one packet every 600 seconds he can hold the session open virtually forever and use this device to wreak havoc on unsuspecting victims. We have seen indications of the attackers holding holding these communications open for months. If all ISPs fully implemented anti-spoofing filters then the likelihood of this sort of attack is lowered substantially. In a nutshell anti-spoofing says that if the traffic is headed into my network and the source IP address is from my network then the source IP must be spoofed, so drop the packet. It also works in the converse. If a packet is leaving my network and the source IP address is not an IP address from my network then the source IP address must be spoofed, so drop the packet. It can't hurt to check your network for NTP servers. A single nmap command will quickly confirm if any are open on your network. nmap -sU -A -n -PN -pU:123 --script=ntp-monlist . If you find one or more perhaps you can contact the vendor for possible resolution. If you own a gateway router that implements full-cone NAT you may want to see if your gateway router implements the equivalent of the Pace �? ?Strict UDP Session Control�?�. This will prevent an attacker from access misconfigured UDP servers on your network. Beware, strict UDP session control breaks things that predate NAT and so expect to advertise UDP ports and anybody can immediately talk to it.